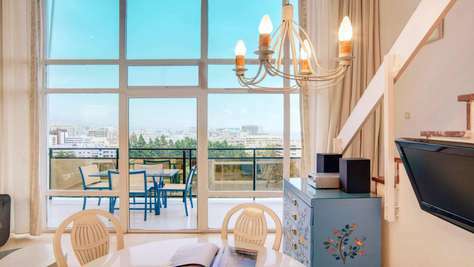 This splendid two-bedroom holiday apartment is a part of the closed and secure urbanization offering great onsite facilities. 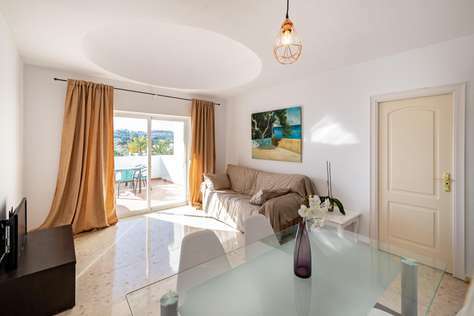 Stylish and well established, this elegant apartment is perfect for your Spanish vacation. Sleeps as standard 6. This fabulous two-bedroom apartment situated on the third floor with the access via elevator. The enter lays through the porch. The bright indoor and outdoor living spaces flow effortlessly and feature comfortable living and dining areas, a full gourmet kitchen and added services like a washer and dishwasher. This holiday apartment for rent contains living room with sitting and dining areas, a balcony and a porch, fully equipped kitchen with marble countertops, microwave, dishwasher, toaster, coffee and juice maker and variety of cookware to cater every taste. There are 2 separate bedrooms and 2 bathrooms. At night you’ll enjoy snuggling down in your sumptuous king bed. Both the luxurious master and other bedroom have quality mattresses and bedding. Outside you can effortlessly enjoy many hours on any of two private cosy balconies. Enjoy a refreshing dip in one of three generous size swimming pools, suitable for kids as well, and lie down on one of the poolside sun beds. 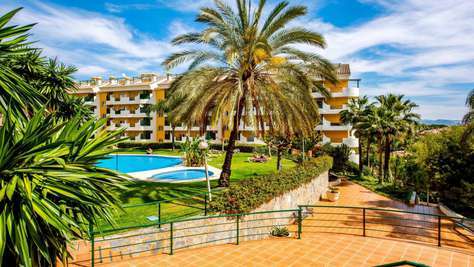 As your apartment is within the one of the best gated urbanizations in Elviria and just a step away from world famous Nikki beach, you can expect the best facilities right on your doorstep. Choose from the oceanfront spa, fitness centre, superlative dining and lounging selections, pool areas, championship tennis courts and pro shop, all sports including golf putting green. Not forgetting the water play area, designed to keep the kids entertained for hours. 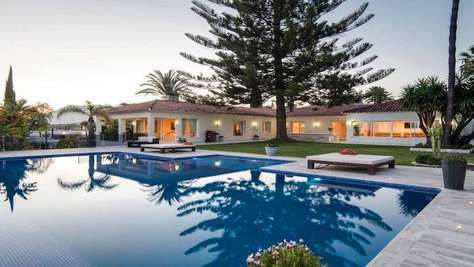 You are in the best area of Marbella, with plenty of quality restaurants, bars, and supermarkets. The area is beautiful and privileged. The private complex offers tropical gardens, 3 communal pools, 24h security service, parking, gym and sauna for an additional fee and only for residents. Nikki beach, one of the best sound beaches of Marbella is in 5 min walking, the road to the beach is car free and strictly pedestrian and surrounded by pine trees. 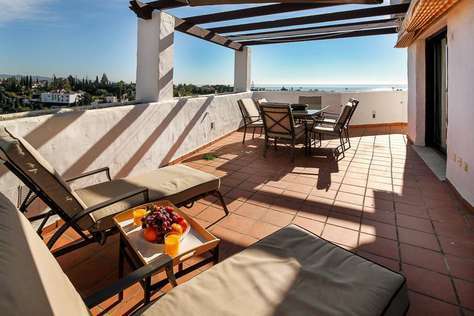 Situated east of Marbella with shops, restaurants, bars, supermarkets, banks etc. 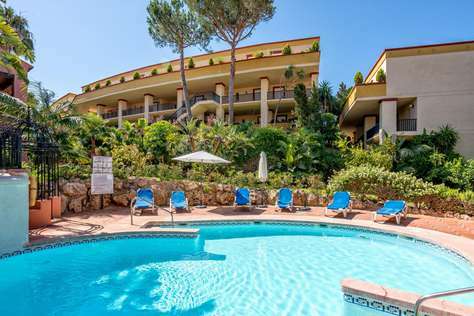 Elviria centre just a 5 min walk away. A short stroll away is Nikki Beach where the rich and famous frequent the beach and nightclub. 10 minutes by car you have the bustling town of Marbella with the famous Orange Square. At Puerto Banus, only 15 minutes away, you can witness the jetset lifestyle along with multi-million pound yachts and super cars. There are many tourist attractions and sport activities, that will keep the whole family entertained, nearby. The individual making the reservation must be 25 years of age or older. This modern holiday house for rent has everything you may need for your perfect vacation. 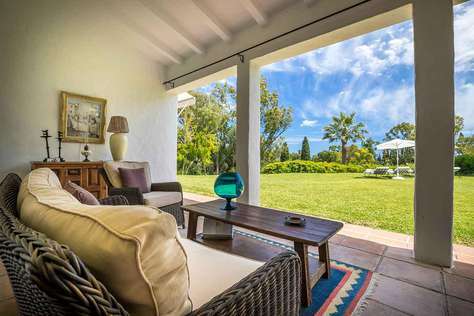 Located in the picturesque gardens in the very heart of Nueva Andalusia, the house offers two master bedrooms with en-suite bathrooms, spacious living room with fireplace. Two french windows open into a generous size patio with a private swimming pool, lounge area and BBQ. This surrounded by high walls patio gives you a sensation of both privacy and relaxation. The house is recently refurbished and redecorated. Andalusian style is perfectly completed with all-modern functionality of the inner space. You can find dishwasher, washing machine, oven, microwave, coffee maker and everything in between in the fully equipped kitchen and storage rooms of the house. WiFi and Satellite TV with more than 100 international channels. Two master bedrooms of the house offer king size bed and twin beds with quality mattresses. Both bedrooms have en-suite bathrooms. 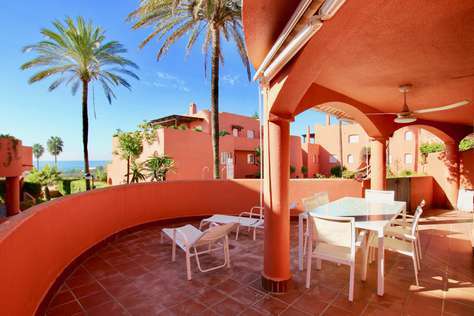 From the french balconies of the bedrooms you have stunning views of the sea and the mountains. Large community pool with both adult and children's pool is 1 min walking from the house. A very picturesque surrounding with Spanish townhouses. Access to hiking trails and the golf courses Aloha, Las Brisas and Los Naranjos. Puerto Banus with its famous night life is only a few minutes away driving. Holiday house for rent on Costa del Sol. 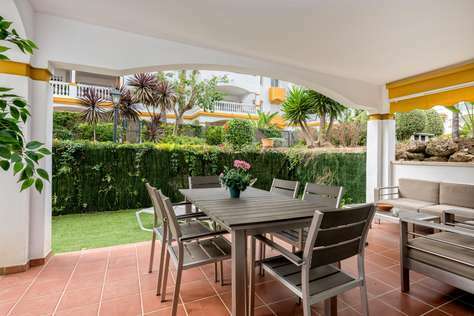 Amazing holiday apartment for rent in walking distance to the beach with 3 bedrooms, 2 bathrooms, large terrace, fully equipped kitchen with dishwasher, microwave, coffee machine and washing machine just in a 7 min walk from the beach in Cabopino, Marbella. On a marvelous terrace, which can be turned into a sunroom, you can enjoy your meal contemplating fantastic sea views. The apartment is modern and newly renovated. Sleeps as standard 6. The complex Las Mimosas offers multiple services, as two shared swimming pools, for kids and adults, tennis courts, table tennis, football and basketball courts, only for residents, private parking and security 24 hours. You will have all amenities, like restaurants, supermarkets, shops, etc., on a short distance. Also, Mijas provides all types of entertainment, like golf camps, hippodrome, water parks, water sports on the beach, and many activities in other villages nearby. We also have baby cots and high chairs for families with little ones available on demand. There is a shared outside swimming pool in the gated territory of the community for kids and adults. One of the best sound beaches of Marbella is in 7 min walking, the road to the beach is car free and strictly pedestrian. Near the beach you will find a romantic italian restaurant Da Bruno surrounded by pine trees. Marbella centre is 14 km away, and the bus station on the motorway is 5 min away. The area is luxurious and privileged, with private villas. Situated a mere five minutes stroll through eucalyptus trees to the sand dunes and beach at Carib Playa it is superbly placed for your beach holiday. There are many restaurants and a supermarket within ten minutes walk, so you do not need to drive. For the golfers amongst your party it is only a five minutes drive from Cabopino Golf club; something to suit all the family! Meanwhile on the beach between Carib Playa and Cabopino, you will find many activities and restaurants, with one of the best sandy beaches in all of the Costa del Sol. The beautiful port of Cabopino and its 170 boat marina is also a fifteen minute walk away through the National Park. Cabopino itself abounds with many restaurants of all nationalities... Chinese, Spanish, Italian and English.... the famous "Albert's on the Dock", is a must for at least one evening meal as you will appreciate its stunningly exotic interior. Meanwhile on the beach between Carib Playa and Cabopino, you will find many activities, and no activities,... well with one of the best sandy beaches in all of the Costa del Sol, even the Naturists have a section to enjoy! Andy's Beach provides rental boats, windsurfing, fishing, paragliding etc. Seasonal beach restaurants line the Cabopino side, and make for great casual lunching on the sand. The bus station of 220 route bus (Marbella-Fuengirola) is on the motorway 5 min away,there is a train station in Fuengirola with connection to Malaga Airport. Modern and light, this holiday apartment for rent offers spacious living room, divided into living and dining areas which opens into generous terrace with dining table for enjoying alfresco. Master bedroom and guest bedroom have their own bathrooms. Fully equipped kitchen has dishwasher, toaster and everything in between. The building is gated and secure, with 24/7 CCTVs and parking lot are for residents only. 2 dining tables with 6 chairs: one in the living room, one in the terrace. The chic and upmarket hotspots of Marbella and Puerto Banus are less than 20 minutes away; while for culture vultures and those looking for a real slice of Spain, the beautiful city of Malaga can be easily reached by train. Golf: The Costa Del Sol is renowned for its golf and there are many excellent courses within a short distance of this resort. It is adjacent to the Cabopino golf course. There are over 25 championship golf courses within a thirty minute drive. 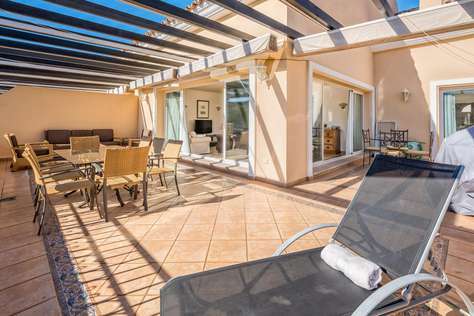 Recently built and modern two storey and two bedroom holiday apartment for rent in Samara Resort Marbella - close both to golf courses and the beach. 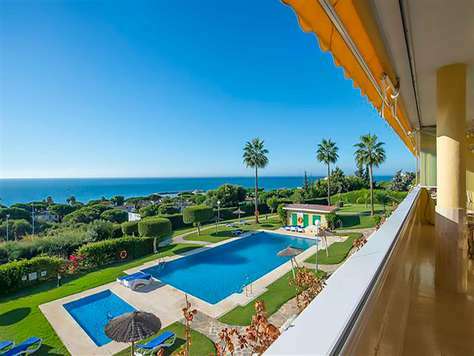 Surrounded by golf courses this holiday apartment for rent offers breathtaking panoramic sea views. The community is newly built up to high end standards. The area is luxury and privileged, with numerous swimming pools, including children pool and heated indoor pool. Well equipped children playground and gym, sauna and hot tub are also available for our guests. This 2 level holiday apartment for rent offers a unique layout, aiming to separate personal and family and provide the best opportunity of relaxation. The main level offers the spacious and bright dining and living area, that transcends into a convenient kitchen. In case you are passionate about cooking, you shall find yourself at home, with all equipment required to produce high-quality meals and host dinners and evenings. The floor to ceiling window of the living room lead onto a tastefully decorated terrace with breathtaking sea views to Gibraltar and Africa. Dining al fresco, relaxing in the lounge with a book, sunbathing or simply enjoying the view, the terrace is perfect for whatever you are up to. The main level has its own guest bathroom. The second level has two bedrooms with their bathrooms and balconies. The master bedroom is bright and spacious, with all facilities guaranteed to make the guest couple's stay comfortable, including comfortable mattresses and pillows. There is an en-suite bathroom in the master bedroom too, with a bathtub and shower available for use. The twin bedroom features two single beds and also has an en-suite bathroom. This holiday apartment for rent is air conditioned and is fitted with a flat-screen TV. A microwave, dishwasher, washing machine and coffee machine are also available. Bed linen is provided. Free WiFi is offered. Other facilities include the communal swimming pools, including children pool and heated indoor pool, well equipped children playground and gym, sauna and hot tub. 24/7 Security and reception. World famous golf courses are just few steps away. Offering a year-round outdoor pool and views of the sea, Samara Resort Marbella is set in Marbella. 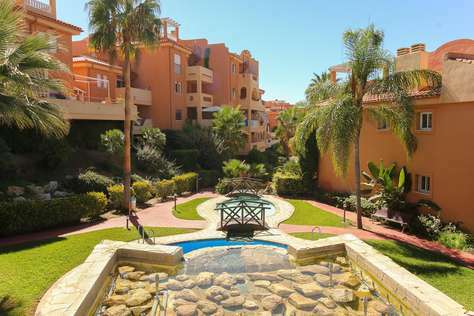 Paseo Maritimo (Marbella centre) is 2.2 km from the property. Villa for rent in Puerto Banus. Ref.55228. This stunning 4 bedroom villa for rent in Puero Banus is conveniently located close to all amenities: just 10 minutes walking to Puerto Banus, close to the beach, restaurants and supermarkets. Modern and recently refurnished the villa meets the highest standarts. Once inside the villa on the first floor you are welcomed into a reception area which leads to a well sized kitchen with a central breakfast isle. 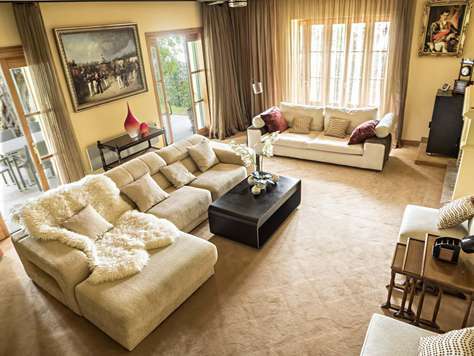 It opens into the large living room with tastefully decorated fireplace, divided into dining and living areas. High wooden double doors of the living area open to the covered terrace and further outside to the beautiful gardens where you could relax by the poolside lounge of enormous swimming pool. The main floor also offers guest bedroom with a single bed, an office with a sofa bed and a bathroom. The top floor hosts master bedroom with in-suite bathroom with hot tub and walk-in wardrobe. Master bedroom with its private generous size East facing terrace offers stunning views of La Concha. Ground floor of the villa is separated, it offers its own living room with a lounge, two bedrooms with king size beds and in-suite spacious bathrooms. First and second floors have i air conditioning. Satellite TV and WIFI are available all over the villa. Solarium on roof terrace, Outdoors Private outdoor pool (unheated), Balcony on the second floor, Private garden, BBQ. 3 king size beds, 1 single bed, 1 pull-out sofas. Dining seats for 8, Lounge seats 8. A big fitness and padel club with a restaurant are just next door the villa (100 m). 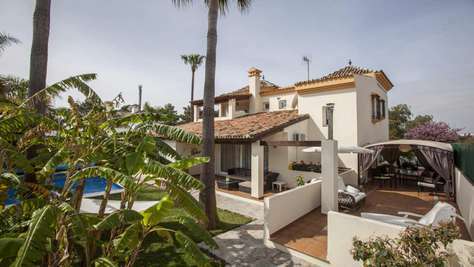 The best property for rent in Puerto Banus area. This villa for rent has everything you may want for your perfect vacation. Behaviour Requirements: There are certain rules, common sense based, regarding behavior that the Guest agrees to comply with. Please avoid making noise at late hours, (also at siesta hours), be polite with the neighbours, leave the surroundings and the common areas clean and free of rubbish, water or damage, comply with the rules of the community and follow the swimming pool rules. Please read the instructions to make sure all the recommendations from the owner are acknowledged. Making fire is totally forbidden in Spain during the summer. The police might be involved in case any of these points are violated, keeping Rafleys Costa del Sol the right to evict the whole party from the apartment. Smoking Policy: All Rafleys Costa del Sol properties are NONSMOKING. Any breech of this policy will result in termination of this agreement, including possible eviction of the property and forfeiture of any monies paid. Guest will also be responsible for the additional cleaning charges.